Members of ICC’s Uniform Rules for Bank Payment Obligation (URBPO) Drafting and Education Groups converged in Paris last week to present the new rules that are set to revolutionize trade finance transactions. Mr Casterman said that ICC’s binding URBPO were critical for protecting banks intermediating trade transactions using the BPO payment method. The BPO provides the benefits of a letter of credit in an automated and secured environment, and enables banks to offer flexible risk mitigation and enhanced financing services to their corporate customers. 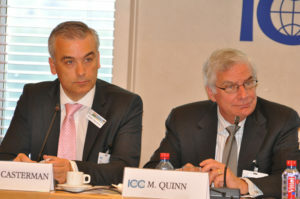 Michael Quinn, Co-Chair of the ICC URBPO Education Group and Managing Director of Global Trade at JP Morgan said that the speed of trade, the complexity of supply chains and the reliance on information and data today is overwhelming. Mr Quinn told participants that over the last 10 years banks and corporates have become focused on financing liquidity down supply chains to ensure products can get to customers. The financial crisis forced a lot of companies to rethink their supply chain strategies and consider ways to ensure integrity down the chain while ensuring it remains liquid and appropriately protected. This, he said, had led to a convergence of corporate needs for supply chain financing with banks’ need to support them in this and an ambition to reduce paper handling so that greater focus can be put on risk mitigation and financing.